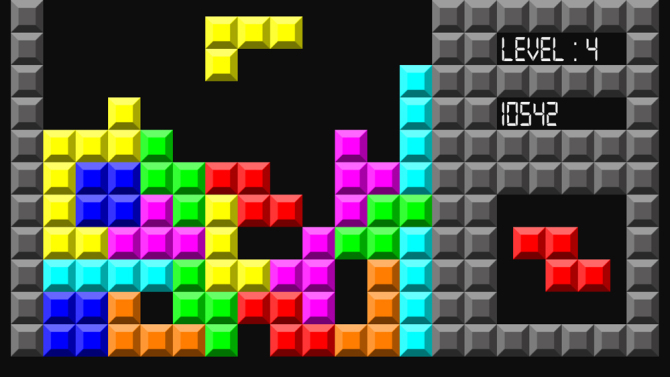 Byte tile is a fun play on the 8-bit game called Tetris. You know when you’re at that point, when all the shapes are dropping really fast and you have gaps where you just need an “L” or “T” shape, but you keep getting that weird step piece!?! (Come on, admit it, you know what I’m talking about.) Then B-A-M the screen fills up… GAME OVER. This tile reminds me of that point when the screen is just about filled up and you’re hoping for that one shape to knock down that top row. Byte’s playfulness makes it really unique; its positive and negative spaces allows for the light to bounce off at different rates and create an eye-grabbing visual effect. Everywhere?! I kid, but honestly this could work great in a lot of different wall applications because of the great range of bright, bold colors and metallic finishes. FORM Architects in DC specified Byte Vermelho (red) on an accent wall in a corporate office kitchen area. 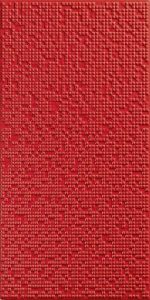 They used a red grout to create an almost seamless effect with the Byte. It looks awesome, FORM! 1.) It is a 9″x18″ format that is subdivided into 4 tiles (approx. 4.5″x9″). 2.) It’s a large format tile that gives the illusion of a straight stacked dimensional subway tile. 3.) I love the geometry within Diamond’s design. It’s composed of random-sized triangles that meet at different locations or high points on the tile. This creates movement that is more organic than other dimensional tiles. 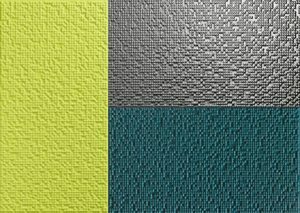 Diamond is a great, contemporary look for a kitchen backsplash or bathroom shower walls in a multifamily building. 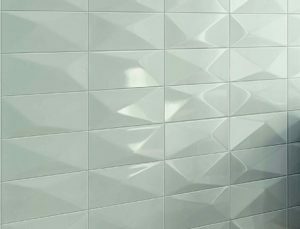 If you would like to use Diamond as your accent wall and have the rest of the walls be subtle, Diamond also comes with a coordinating 9″x18″ smooth white tile (Brilliant). Size: 9″x18″, 12″x24″, 14″x39″, Stacked Mosaic 1″x4″ | Not all sizes are available in every design. Please see website cutsheet for availability.